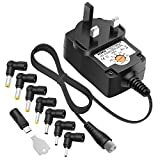 Universal 12W replacement power adapter for many kinds of household electronics, like Router, Radio, Speaker, CCTV camera LCD, and micro USB connectors for most smart phones etc. With 7 very popular connectors and 1 USB connector, meet your power needs perfectly indoor. Input:110-240V, Output: 3V/2A, 4.5V/2A, 5V/2A, 6V/1.5A, 7.5V/1.5A, 9V/1.5A, 12V/1A, Max 12W All the DC connectors have – on the outside and + on the inside.And its polarity cannot be reversed. Please confirm the specifications and plug size before purchasing!If you can’t make sure,pls feel free to contact us. *With protection of over voltages, over current, short circuits and over temperature, bring much safety! *12 Month Warranty to make sure excellent user experience! 1.Tip 1 to Tip 7: Many small household electronics, like routers, CCTV cameras, Radio, Speakers, LCDs, Pi 1 2 3 etc. 2.Micro USB port are used to power most Android Smart Phones, Tablets, BT Speakers and other Micro USB charging devices. 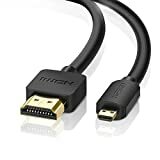 Micro HDMI to HDMI Cable will help you to Stream Audio and Video From a Smart Phone Through the Micro HDMI Port to Your HDTVs or Projectors with HDMI port.Play games on your big-screen HDTV or share high-definition video and digital audio together with your family and friends. High-Speed HDTV HDMI to Micro HDMI Cable Combines HD audio & video (up to 2160p) into 1 cable for many home theater needs. Durably built for clear signals & minimal interference/physical strain. -HDMI ports supporting Ethernet are needed for internet sharing. -This cable will NOT work with Samsung Galaxy Phones Or Samsung Tablets with Micro USB Connection.